As part of BlogFest Asia 2012 program, we got a chance to visit one of three main tourism destinations in Siem Reap: the Floating Village, Angkor Archaeological Park and Siem Reap town. This optional trip was provided by BlogFest Asia committee for those who wanted to submit entry for blog competition. 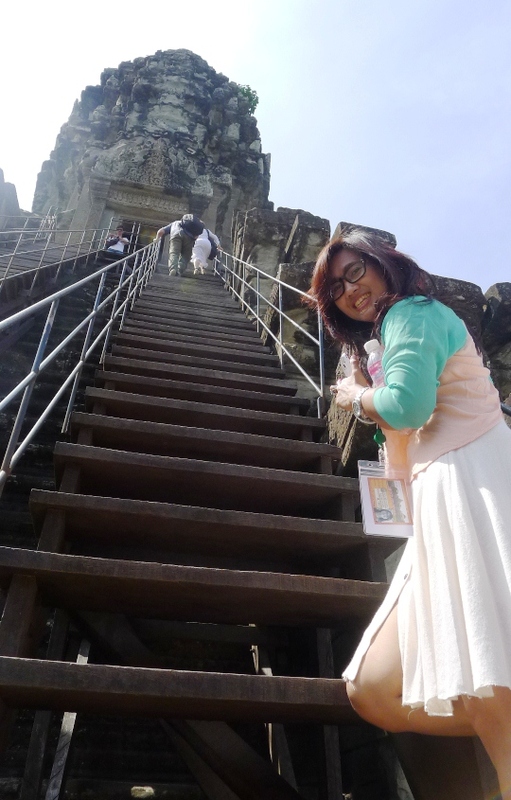 It was obvious which option I chose at the first place: Angkor Wat and surrounding areas. 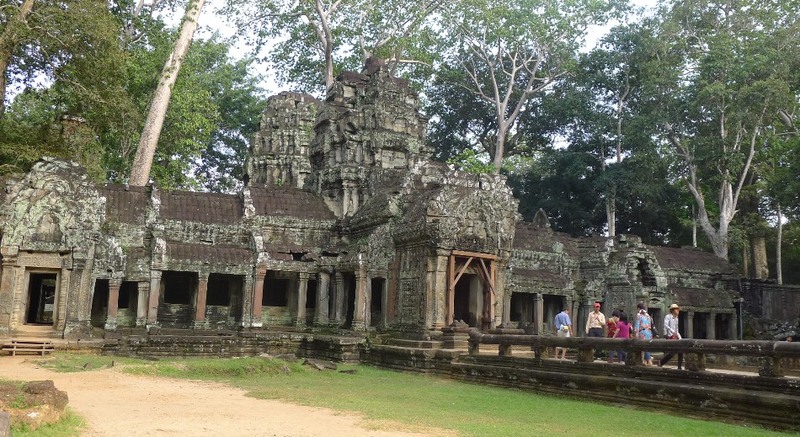 Coming to Siem Reap without visiting Angkor Wat is like coming to Mecca without visiting Kaaba. Or coming to NYC without taking picture of yourself with the Statue of Liberty in the background. Doesn’t mean that the other places aren’t interesting for me, but it’s Angkor Wat and all I knew was I have to go there someday. It was on my bucket list for so long. Beside that, I always adore ancient buildings like temples. The huge size of Angkor Wat makes it even more amazing and adorable. I wonder how did the Khmer people build those magnificent mega-structures without using modern technology like our people use nowadays. Anyhoo, it was Friday morning after program briefing at the Build Bright University (BBU) when most of us gathered waiting for the trip arrangement. I shared the first tuk-tuk with Chichi and two Burmese bloggers. BlogFest Asia Commitee arranged one-day rent of tuk-tuk for us, its cost was around $15. 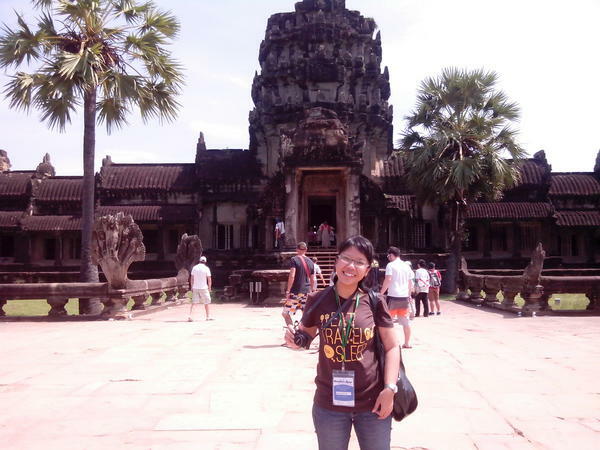 Our first destination was Angkor Wat, the most famous temple located in Angkor Archaeological Park. There’s a ticket booth where we were required to pay $20/person for One Day Pass. They printed visitors’ face on the ticket, makes it a non-transferable ticket. Every time a visitor entering different temples, officer at the entrance will asks them to show the ticket. Smart idea. As you may know, Angkor Wat –previously was a Hindu temple- was built as a representation of Mount Meru, a mythical sacred place for Hindu. Later, Jayavarman VII converted to Mahayana Buddha and then built some other temples (Bayon, Ta Prohm, Preah Khan) in Buddhist structures. Although it was neglected since the 16th century, Angkor Wat was never completely abandoned. 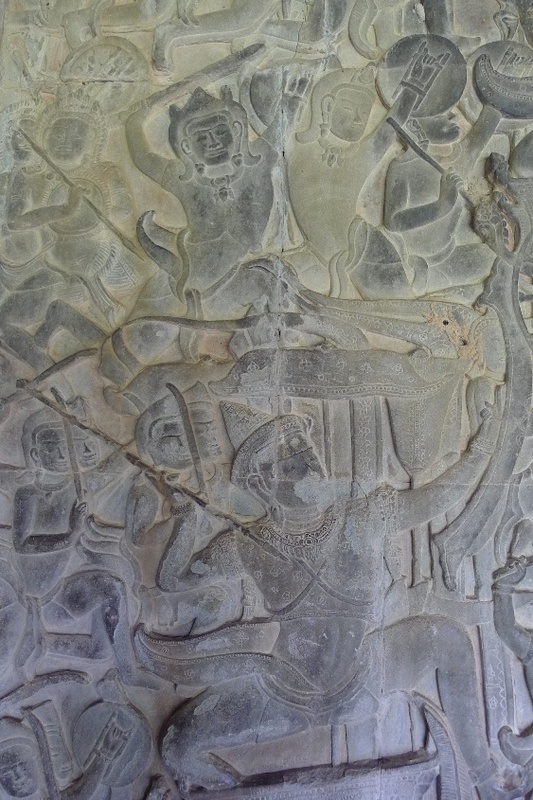 Later, Angkor Wat moved to Theravada Buddhist use which continues to present day. We can find some Buddhist monks and visitors praying in various locations inside the temple, put some offerings as well as inviting visitors to pray too sometimes. Every inches of Angkor Wat amazed me. It was started by looking at size of the baray (water reservoir) that was built around the Angkor Wat which has 8 x 2.3 km in size. Can’t imagine how did ancient Khmer people build such a super huge reservoir like that! If you ever read or watched Ramayana and Mahabarata epic, you must be amazed by the bas relief carved at the left end of the temple. It’s depicting various scenes from battle of Ramayana war, battle of Mahabarata and some other scenes from Hindu epics. We also climbed up its central tower. Even though its height made me nervous at first –it’s a super tall tower-, somehow I made it to the top by stepping slowly on its stairs one by one, without ever removing my hands from the handrails even once. The view from the top was extremely beautiful, yet it was scary considering that you’d have to climb those steep stairs first. Oh yeah, there’s also Angkor Balloon that serves tourists who want to watch sunrise above the Angkor Wat complex. I should’ve tried it on my last morning in Siem Reap, but I was too tired I couldn’t even wake up. The second temple we visited was Ta Phrom. The temple mostly got famous for its use as the Tomb Raider movie shooting location years ago. Apart from its history, the temple -that is now being restorated- has this exotic view with trees and roots surrounding and growing above the temple. 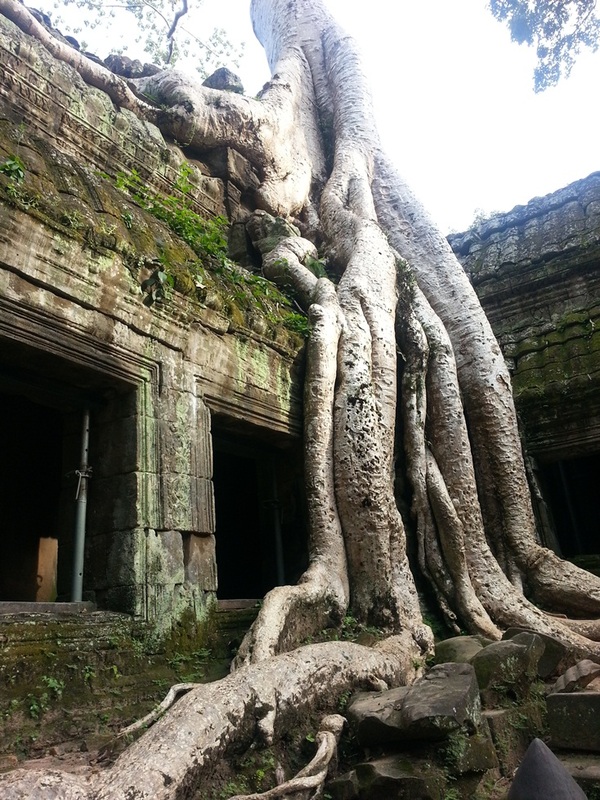 It’s like the tree is eating the temple from outside with its giant roots. Exotic yet stunning combination between nature and human handiwork. The restoration has been ongoing since 2010. Outside the temple, we can found ruins of its original structures. Wooden walkways has been erected to provide safer and more comfortable paths for visitors. yes you right. Angkor Wat is like a Mecca for Buddhist and even non-Buddhist. 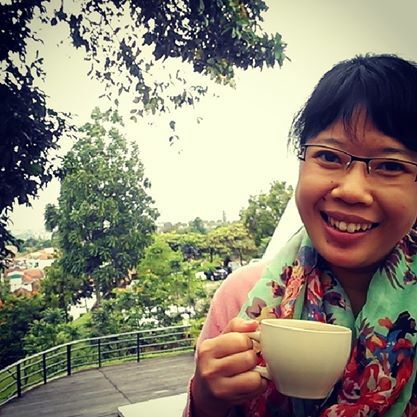 Mbak, how do you do? nice posting anyway..